Average Time (H:MM:SS) is 0:57:30. Range is 0:37:30-1:26:30. See a short highlight video of this leg here. Please be in the designated start area and be in position when your teammate is approaching. The runner will follow a well-defined eight mile route along Mt. Baker Highway; mile markers will be in place along the race route. Water stations will be set up near mile 3 and mile 6, and runners will be checked off by bib number at several checkpoints. The downhill run will consist of a 2,200 foot drop in elevation. Runners must remain on the right side of the road; runners who cross the double yellow line will be disqualified. Official observers appointed by the race committee will be monitoring this. Also, please be aware that there may be Highway Patrol traffic on the highway. There will be a pre-race meeting at 7:45am on Race Day outside of the Heather Meadows Lodge. IT IS MANDATORY THAT ALL RACERS ATTEND THIS MEETING TO GET THE LATEST SAFETY INFORMATION ABOUT THE COURSE. Race Timing Chips will consist of the chip on a wristband, and must be passed onto the next racer at each leg exchange area according to the rules. Runner: swipe the chip in front of the bulls-eye to create a finish/start time, run your event, swipe the chip in front of the bulls-eye at the end for a finish/start time, pass the chip to the road biker. A designated team representative must pick up the team’s race packet prior to the race. The packet includes the team timing chip, racing bibs and T-shirts. The designated team representative must distribute items to team members. There will be no extra racing bibs at the exchange areas. Appropriate attire for a race on pavement is required. I-Pods, MP3, Walkman or similar music/audio systems are NOT allowed to be used by the racers while competing. 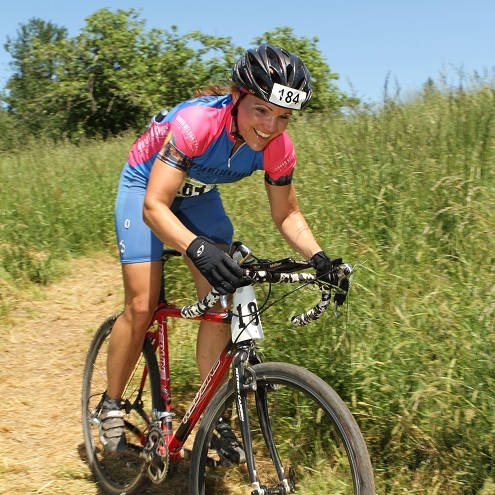 After the Timing Chip handoff to your bicyclist, exit the lane to your left and enter the grassy area. Bottled water will be available. It is a good idea to leave behind some gear for you in a weatherproof bag with your bike racer teammate. Examples of such gear would be towels, warm and dry clothing, gloves, hand warmers, rain gear, and an umbrella. If you want to cross the “chute” to the bike side of the exchange, do so only at the marked pedestrian crossing; do not cross at the finish line. There is a “bag drop” area located on the runner side of the exchange about 100’ east of the finish line. The bag drop is an honor system so please make sure you pick up the correct bag. Your time for the running leg will not be available at this exchange area as there is no internet access at this site. Timing data is relayed by ham radio operators and updated every few minutes, but since there is no cell phone service, you will not be able to view your time. If you want to know your time immediately, please use a personal timing device. If you are being picked up by a car from the ski area, it is important that your ride knows where to pick you up. The simplest approach is to wait in the grassy area at the DOT for them; cars will be allowed to stop on the shoulder at the DOT to pick up runners. Please watch for your car to minimize the time it is stopped since there is limited space. If you have a car at Sno-park, you may walk back there at any time. Cars will be allowed to leave Sno-park when the “sweep van” has passed the parking lot. If you absolutely have to be picked up at Sno-Park, your ride will need to turn into the Sno-Park driveway and pick you up in the parking area. Cars will not be allowed to stop and load runners on the highway at Sno-Park. A designated bag drop area will be available in the grassy area in front of the Run/Road Bike Exchange and you may leave a bag with your Road Biker. Attach a weather resistant tag to your bag showing your team number and phone number. The bag drop is an honor system so please consider that when deciding what items to leave. The bag drop area is not sheltered; therefore, a weather resistant bag is a good idea. Please do not attempt to have your bicyclist pass you your bag at the start/finish line. The Mt. Baker Highway (542) will be closed from 7:15 AM to 11 AM between Canyon Creek Road in Glacier and Mt. Baker Lodge. Any viewers, participants or additional support vehicles who want to go to the top of the mountain must pass Canyon Creek Road prior to 7:15 AM. It is recommended that both of the Skiers, the Runner, and the Road Biker carpool to the mountain. 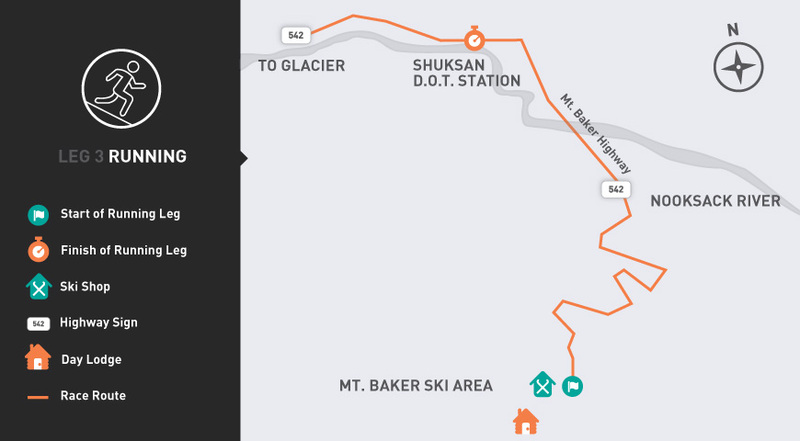 The Road Biker will be dropped off at the Salmon Ridge Sno-Park, ½ mile past the Shuksan DOT snow shed, where volunteers will be directing traffic. 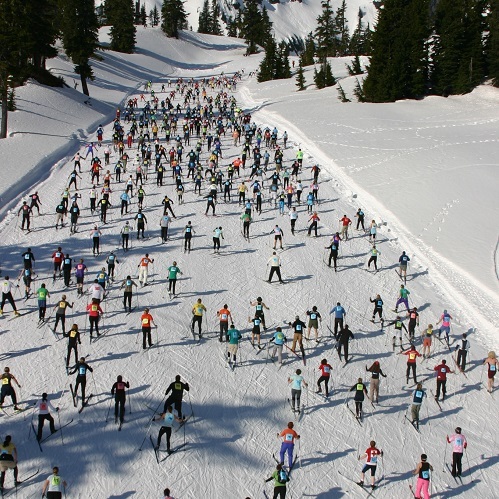 The Skiers and the Runner then proceed up HWY 542 to the main parking lot at Heather Meadows. After the Runner has completed his/her course, and HWY 542 has been swept, vehicles will be allowed to depart from the ski area parking lot. The Runner will be picked up at the runner/bike exchange area by the Skiers on their return. This will reduce the number of vehicles on the road and at the parking area. Racers should leave Bellingham by 5:00 AM to ensure they make it to the ski area for the 7:45 AM Pre-Race Meeting. After sufficient time has elapsed from the release of the last runner, a Sweep Van will proceed down the mountain followed by the Washington State Patrol. All cars on the mountain can follow behind the State Patrol. Cars parked in Sno-Park will be released after the State Patrol has passed Sno-Park. Runners that are still on the course will be picked up by the Sweep Van and taken to the DOT Race Exchange site. Infraction of the rules by one team member may disqualify the entire team. It is important for all racers to show their bib numbers when crossing the exchange areas. Timing of individual legs may vary based upon exchange area layout. Therefore, personal time kept by racers may not correspond to official results. 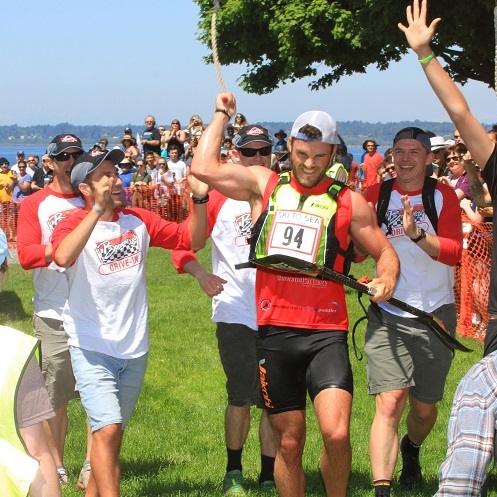 If you want to volunteer for the running leg of the race, please fill out our Volunteer Form.